was born in 1984 in Manila, the Philippines; he is a native of the United States. He earned his Bachelors in Biochemistry with a minor in Latin American and Latino Studies from the University of Pennsylvania in 2007. He has worked as a research assistant on investigations of the behavioral psychopharmacology of antidepressants as well as the clinical effectiveness of therapies for tobacco dependence in the Psychiatry Department of the University of Pennsylvania. From 2006 to 2008 he coordinated the UPenn Consciousness Discussion Group. 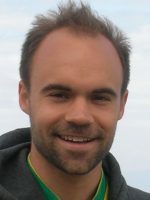 His research on ayahuasca includes investigations of the ritual use of ayahuasca to treat substance dependence, as well as an analysis of the “environmentalist ethos” of the União do Vegetal; he also does translations from Portuguese to English of texts related to the study of ayahuasca. He is now concurrently studying Medicine at Stanford University. He intends to specialize in psychiatry and medical anthropology; his research interests include depression, mind-body medicine, and the clinical and folk uses of psychedelic agents for therapeutic and religious ends. He is also an associate researcher at the NEIP – Núcleo de Estudos Interdisciplinares sobre Psicoativos (Interdisciplinary Group for Psychoactive Studies).